Westwide SNOTEL basin-filled map March 3, 2019 via the NRCS. This year’s statewide average snowpack is dramatically higher than any time in the past three years, and currently stands at 113 percent of normal. The pack is also a whopping 58 percent higher than last year’s dry winter, which peaked and melted early, resulting in a shortened season that disappointed many whitewater enthusiasts. The area is not expected to see above-average temperatures in March, April and May, he said. But every storm is different and the long-range forecast for average temperatures does not rule out periods of warm weather, he said. Nighttime temperatures below freezing would help moderate the runoff flows, Knowlton said during an Animas River Community Forum on Thursday. The forum brought together representatives from government agencies, ditch companies and nonprofits working on flood mitigation. Some groups are working on construction projects to divert water and improve flood prediction, but not many projects are expected to be in place before spring runoff. In the short-term, La Plata County plans to install temporary temperature and rain gauges that will help predict flooding this spring, said Tom McNamara, emergency management coordinator for the county. The county is also working on putting in another temporary radar system during the summer that would help predict monsoonal systems, Knowlton said. Flood mitigation on private property is also expected to get started this year, possibly during the summer, said county spokeswoman Megan Graham. The county will put out bids for the construction, potentially for several properties at a time, she said. “We want to get the work done as quickly as possible, but there are administrative steps that have to be taken,” she said. Federal funding will cover 75 percent of the construction on private land through the Emergency Watershed Protection Program. Property owners interested in participating in the program will be responsible for up to 25 percent of the cost, she said. Five irrigation companies in the Animas Valley are also preparing for runoff waters that flow into ditches and are carried to areas they would not naturally go, said Ed Zink, the secretary and treasurer for Animas Consolidated Ditch. The ditch companies received about $200,000 in grant funding and provided about $100,000 in a local match to fund construction and to help keep ditches clear of silt and debris. This spring, Animas Consolidated Ditch plans to put in gates and help direct floodwaters to the Animas River, Zink said. At long last, after several large storms, snow water equivalency (SWE) and precipitation data are reported as being above average for this first time this winter. According to a press release craft- ed by Pagosa Area Water and Sanita- tion District Manager Justin Ramsey, the SWE was 26.1 inches as of Feb. 25, while the median was only 25.5 inches. With those recent totals, SWE is now 102.4 percent of median, up from last week’s total of 88.9 percent of median. “It’s good, we’re all above average now,” Ramsey said in an interview. With limited snow in the forecast, Ramsey noted that the SWE levels will probably stay about the same with minimal melting occurring at the Upper San Juan site. “But, we’re probably going to drop below 100 percent again because the average always goes up a little bit,” Ramsey said. The median and averages are based on data from 1981 through 2010. Last week, the SWE was measured at 20.6 inches while the median was listed at 23.2 inches. Precipitation currently is 29.5 inches while the precipitation av- erage is 26.9 inches, making the precipitation totals 109.7 percent of median. Last week, precipitation totals were only 24.5 inches while the median was 25.4 inches, making the total 96.5 percent of median. Human visions have shaped fundamental contours of the sui generis place in western North America called the Colorado River Basin. Diverse and often conflicting, such visions have been held collectively and individually, embodying wide-ranging aspirations and imaginings as to how the basin proper and its vast outlying areas should be inhabited. One-armed Civil War veteran John Wesley Powell was a seminal visionary in this realm—leader of the 1869 Colorado River Exploring Expedition, author of the 1878 Report on the Lands of the Arid Region of the United States, Founding Director of the Smithsonian Institution’s Bureau of Ethnology (1879-1902), and Second Director of the U.S. Geological Survey (1881-1894). It would be difficult to overstate the influence of Powell, his ideas, and successors thereto on the character of the basin. For good or ill, it bears his name with Lake Powell, as just one testament. 2019 marks the sesquicentennial of Powell’s epic 1869 Expedition down the Green and Colorado rivers—a celebratory occasion for both a Sesquicentennial Colorado River Exploring Expedition (SCREE) and earnest scholarly revisitation of Powell’s legacy. Powell regarded the 1869 Expedition as a journey “into the great unknown.” Yet myriad aspects of how the basin and adjacent environs are currently being inhabited suggest this phrase applies with equal force to the basin’s future and our navigation of it. This basic premise underpins the multi-author volume being prepared in conjunction with the SCREE project—tentatively entitled, Vision and Place: John Wesley Powell and Reimagination of the Colorado River Basin. It is a multi-disciplinary collaboration involving 16 authors, 6 visual artists, and 2 cartographers hailing from the Colorado River Basin states and beyond. The volume aims not only to shed light on Powell’s visionary ideas upon the sesquicentennial, but also to consider the contemporary influence of those ideas in and around the basin, and ultimately to prompt dialogue about what we wish this beloved place to become. Click here to go to scroll through the list of contributors. Friend of Coyote Gulch, Patty Limerick, and Amy Cordalis show up as does Robert Glennon. Parts of the Uncompahgre River have become “unstable” and “injured” over time due to past land use practices, leaving some areas packed with landfill material like debris and rubble, City Engineer Scott Murphy said. But now, the City of Montrose will be able to refine portions of the river, in part due to a $400,000 grant given to the city by the Colorado Water Conservation Board (CWCB). The funds come through the Colorado Watershed Restoration Program to enhance the Uncompahgre. Additionally, aerial images have shown the river channel has migrated around 400 feet in some places over the past 50 years, Murphy indicated. “It’s a pretty unstable breach of the river which is bad for the habibat because once the fish habibat gets established it gets wiped out as the river moves,” he said. City of Montrose grant coordinator Kendall Cramer also said the Uncompahgre has experienced flow modifications and encroachment, which has developed a wider channel, bank stabilization issues and a lack of aquatic and riparian habitat. He added the project will fix those problems as well as create better aquatic environments, stabilize the river banks and give the public better access to the water. The project design is being done by Ecological Resource Consultants, which won the bid for it in 2017. The River Restoration Committee and volunteers have helped the project come to fruition and have given input on the design, Cramer said. The city anticipates construction to begin in winter of 2019-2020. Due to the river flow, work has to be completed within a four-month timeframe of November to February, when the water is at its lowest point. The Dolores River Boating Advocates will have their annual river permit party on Jan. 25 from 6-10 p.m. at the Dolores Community Center. The event features films, food, drinks, a silent auction with river-themed items and live music by Halden Wofford and the Hi Beams. 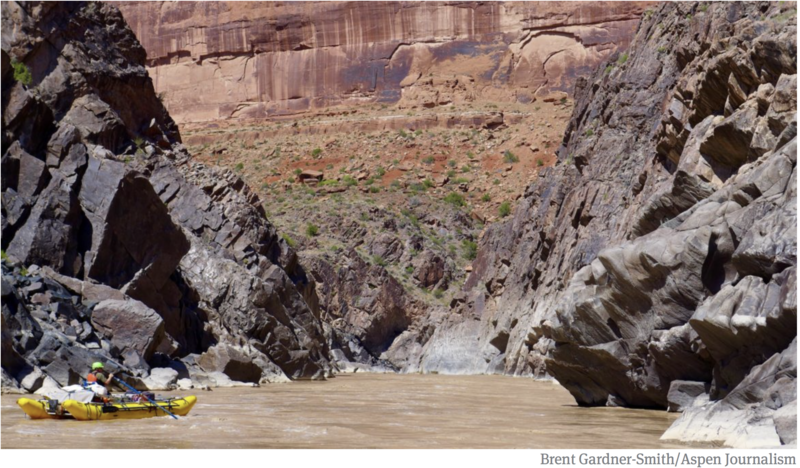 The Dolores River does not require a permit, but there will information on the regional rivers that do. The event is a chance to meet new boaters, plan river adventures and connect with the local river-running community. Advance tickets for the permit party and concert are $12, or $15 at the door. Go to the website of the Dolores River Boating Advocates to buy online. St Louis Tunnel Ponds June 29, 2010 – view south towards Rico. Photo via the EPA. The river part of Eagle’s ambitious river park is done, and even the fish appear to be happy about it. Tell experienced river runners that 2 million acre-feet of water — as much water as in 20 Ruedi Reservoirs — is going to be released from reservoirs and sent down the Green, Gunnison and San Juan rivers to boost falling water levels in Lake Powell, and they will likely have some good questions. 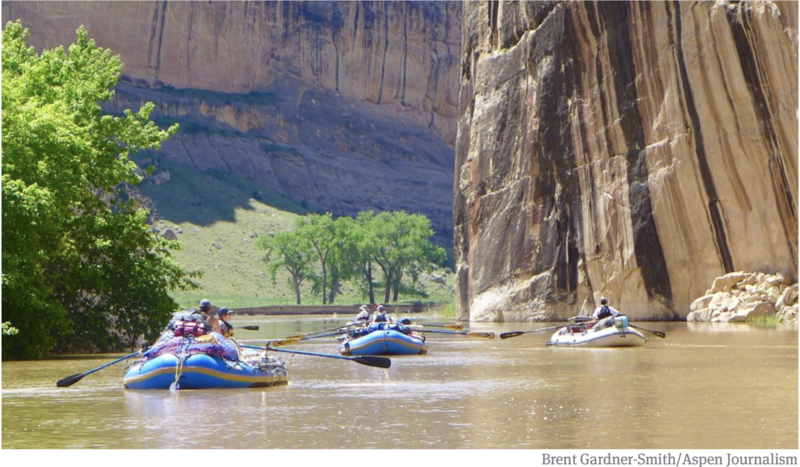 Will peak spring releases from Flaming Gorge Reservoir down the Green River turn Hell’s Half Mile in the Gates of Lodore into a raging maelstrom? 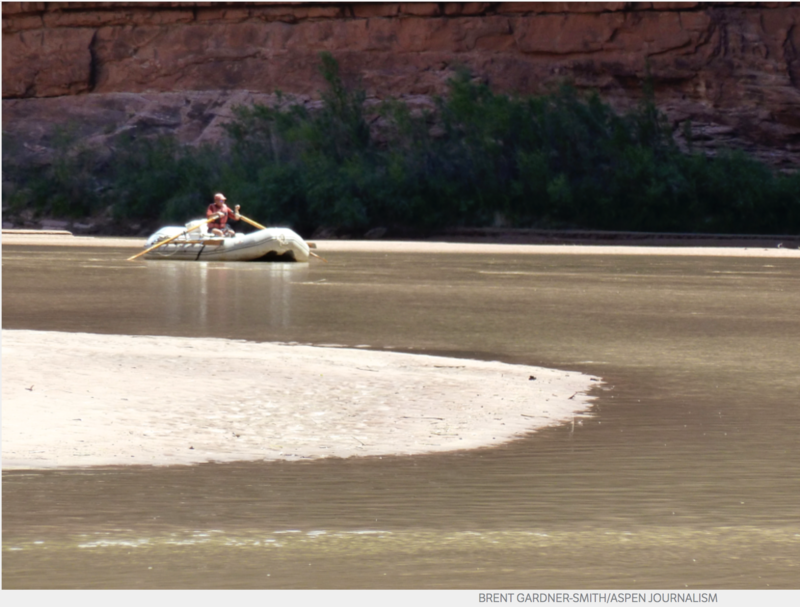 Will early-spring and late-summer releases out of Navajo Reservoir on the upper San Juan River make it easier to float over the growing sandbars in the river below Grand Gulch? 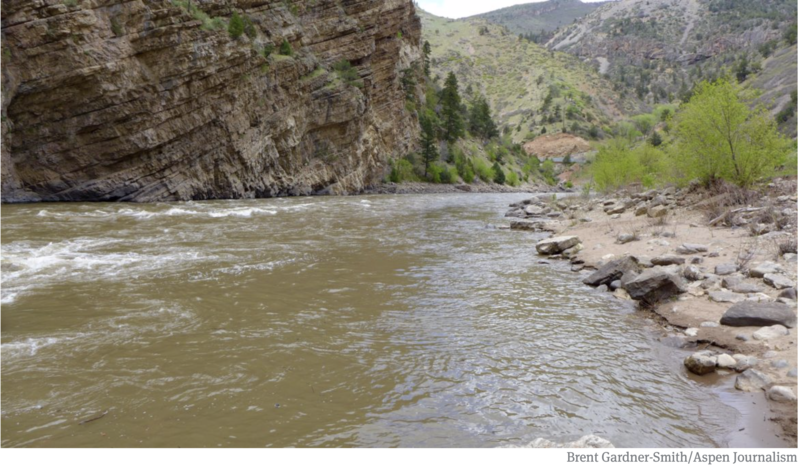 Will releases from Blue Mesa Reservoir run down the Gunnison River and into the Colorado River and make it likelier that flows past Skull Rapid in Westwater will stay longer in the “terrible teens,” or at flows over 13,000 cubic feet per second? For now, there are no definitive answers to such questions, but one federal official suggests boaters may hardly notice the release of water from the three reservoirs. An agreement was approved last week in Las Vegas by the Upper Colorado River Commission that sets up a process for Colorado, Utah, Wyoming and New Mexico, and the federal Bureau of Reclamation, to develop a plan to release about two million acre-feet of water from the three reservoirs, but it is, at this point, only an agreement to make a “drought operations” plan, when necessary. “The agreement, importantly, doesn’t itself include a plan. Rather, it sets forth a process for establishing a plan based on modeling projections of Powell elevations,” Amy Haas, the director of the UCRC said during a presentation here last week at a meeting of the Colorado River Water Users Association. Still, boaters want to know, where might the water come from under such a plan. When it will come? And will it make a difference on the river? “I really don’t think it is going to be noticeable, because we see quite a bit of fluctuation in the upper basin in all of these systems, when we have abundance and when we have drought, and this fits within those bands,” said Brent Rhees, the regional director in the upper Colorado River basin for the Bureau of Reclamation, which operates Flaming Gorge, Blue Mesa and Navajo reservoirs, as well as Lake Powell. It also says water will be released from all three reservoirs, though not necessarily at the same time, and an effort will also be made to balance hydropower needs. (Also, please see related agreements on demand management storage in Lake Powell, a “companion agreement” to an a drought contingency plan agreement in the lower basin, and Exhibit 1 to that agreement). Flaming Gorge, Navajo and Blue Mesa reservoirs were built, in large part, to serve as backup buckets to Lake Powell, but they have yet to be called upon for such duty. Of the three reservoirs, Flaming Gorge is the largest, with a capacity to hold 3.8 million acre-feet of water behind its dam, which is in Utah near the Wyoming border. Navajo Reservoir, which is in northern New Mexico, on the San Juan River, holds 1.7 million acre-feet. And Blue Mesa Reservoir, one of three dams on the Gunnison River that make up what’s called the Aspinall Unit, holds 940,800 acre-feet. Of course, before water can be released from reservoirs, they must have water in them — and that’s no longer a given. Today, according to the Bureau of Reclamation, Blue Mesa is only 30 percent full, holding 248,220 acre-feet of water; Navajo is 52 percent full, holding 883,737 acre-feet; and Flaming Gorge is 88 percent full, holding 3.3 million acre-feet. (Please see “teacup” graphic, with current reservoir levels). The water to be released, if needed, from the three reservoirs is meant to help maintain a target elevation for the surface of Lake Powell — as measured at the upstream face of Glen Canyon Dam — of 3,525 feet above sea level. So, if very dry conditions persist in the upper basin and the reservoir level keeps falling more than 30 feet a year, it’s possible that the critical elevation of 3,525 could be reached within two dry years. The most recent 24-month forecast — issued by the Bureau of Reclamation on Wednesday — “projects Lake Powell elevation will end water year 2019 (at the end of September) near 3,571.23 feet with approximately 9.21 million acre-feet in storage,” or at 38 percent of capacity. That means by October, Lake Powell is already projected to be 13 feet lower than it is today and only 46 feet above the target elevation of 3,525 feet. Nothing physically occurs at Glen Canyon Dam at 3,525 feet, but it’s seen by regional water managers as an alarm bell on the way to the reservoir falling to 3,490 feet, or minimum power pool, which is when water can no longer be sent down intake tubes to the turbines in the dam. At elevations below 3,490, when the reservoir is heading toward “dead pool,” it becomes ever harder to release water downstream through the dam’s outlets, which could mean the upper-basin states would fail to meet their collective obligation to send enough water to the lower-basin states (California, Arizona and Nevada) under the 1922 Colorado River Compact. Although violating the compact was once seen as a far-off, distant possibility, it’s not seen that way anymore. 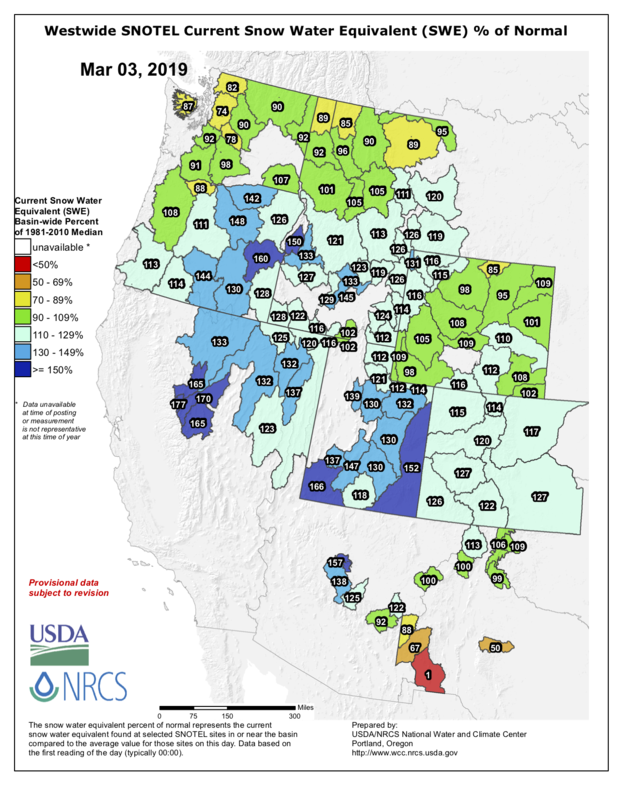 “In water year 2018, unregulated inflow volume to Lake Powell was 4.6 million acre-feet (43 percent of average), the third-driest year on record above 2002 and 1977,” says the Bureau of Reclamation’s latest forecast, issued Wednesday. It also says that inflows into Lake Powell have been above average in only four of the past 19 years. Editor’s note: Aspen Journalism covers water and rivers with The Aspen Times. The Times published this story on Monday, Dec. 17, 2018. 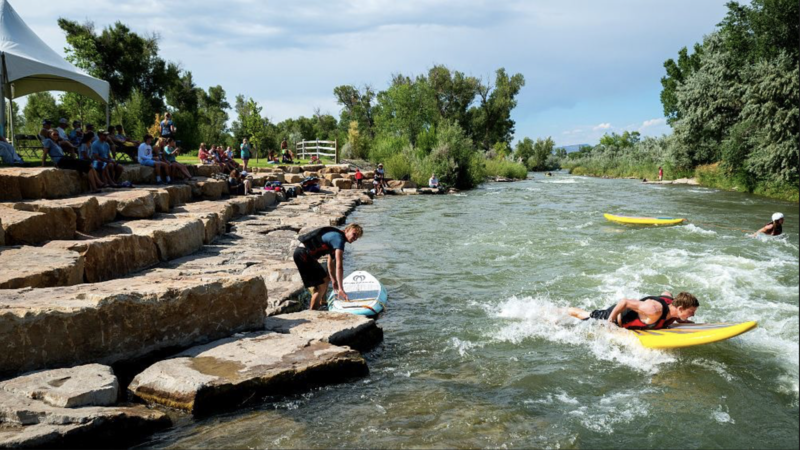 The city of Glenwood Springs has paddled around the last of several big obstacles in its way to obtaining water rights for three potential whitewater parks in the Colorado River, at Two Rivers Park, Horseshoe Bend and No Name. While final approvals are not expected from various entities until late January, the city’s water attorney, Mark Hamilton of Holland and Hart, told a state agency last week that general agreement in the water court case was at hand. Glenwood Springs made the crux move in its five-year journey on Wednesday, when Aurora and Colorado Springs signed off on a “call reduction provision” in the city’s proposed water rights decree. The provision carves out 30,000 acre-feet from the city’s proposed 2013 water right to allow for future upstream transmountain diversions by the Front Range cities. 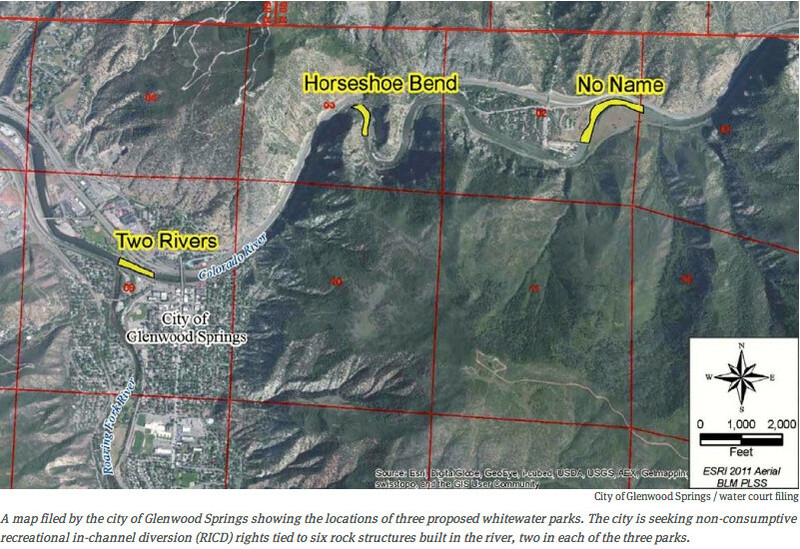 Glenwood Springs had earlier offered a 20,000 acre-foot carve-out provision. The city made another key maneuver on Thursday, when the directors of the Colorado Water Conservation Board agreed to amend a negative 2015 finding on the city’s water rights application, and agreed to settle with the city in water court. It was also announced Thursday that the Colorado River District and the town of Gypsum support the settlement in concept and are working on final approvals. 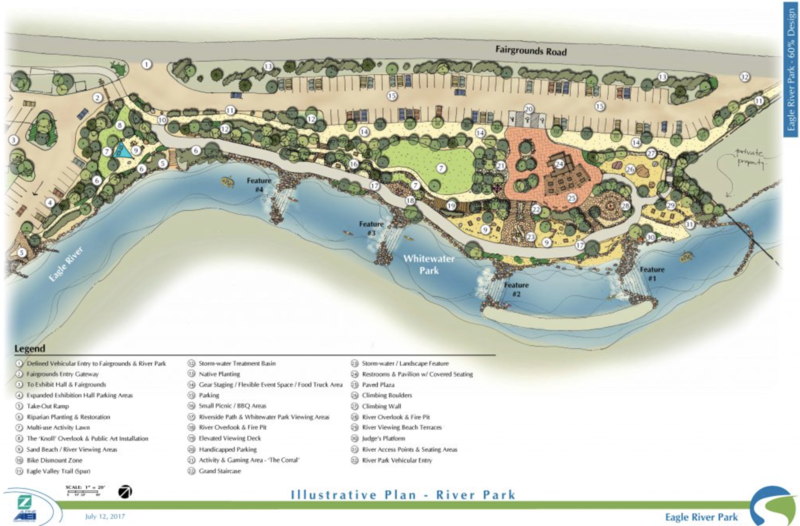 The Two Rivers Park location is just downstream from central Glenwood Springs, and just above a busy boat ramp at the park. Horseshoe Bend and No Name are not far upstream from downtown in Glenwood Canyon. They are on a Class II stretch of river below the Class III-to-Class IV Shoshone run. The highway is separated from the river at Horseshoe Bend, and there is an I-70 rest stop next to the river at No Name. The city has previously obtained settlements in the water court case from BLM, CDOT, Denver Water, Ute Water Conservancy District, Grand Valley Water Users Association, West Divide Water Conservancy District and the Glenwood Hot Springs Lodge and Pool. “This ends three years of really intense negotiations and collaborations with the applicant (Glenwood Springs) and a lot of work finding compromise and middle ground on this,” Pat Wells, general manager of water resources and demand management at Colorado Springs Utilities, told the CWCB Thursday. Aurora and Colorado Springs, as partners in the Homestake storage and diversion project, have a high interest in the city’s claims for flow levels in the Colorado River, as they now intend to build a dam and reservoir on lower Homestake Creek as part of the “Eagle River MOU” project, according to an October report from the attorney of the Colorado River District to the district’s board. That project includes diverting 20,000 acre-feet of additional water under the Continental Divide from the upper Eagle River basin. It also includes diverting 10,000 acre-feet of water for Western Slope uses. 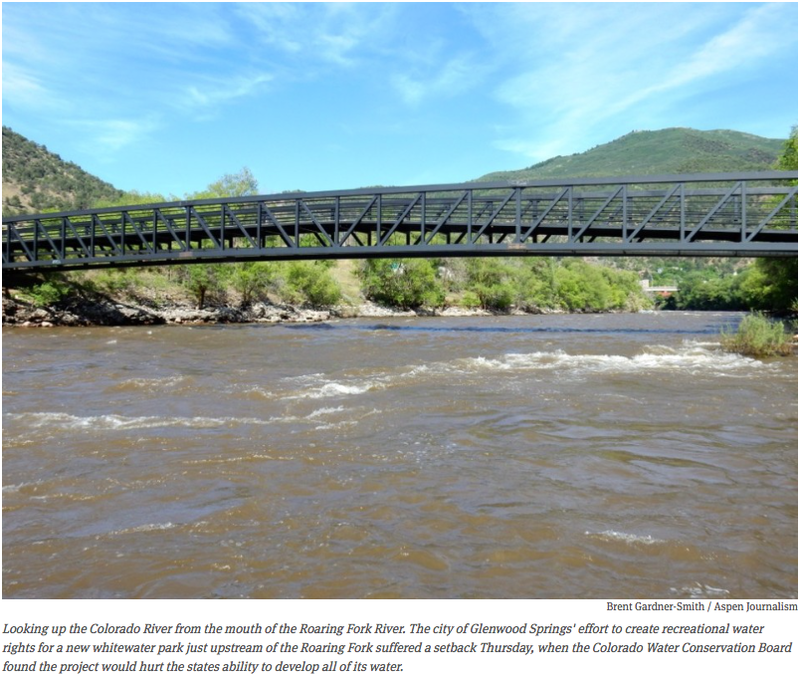 As such, Aurora and Colorado Springs wanted some protection from Glenwood Springs’ pending water right, which would carry a priority date of 2013. The city’s water right would span 183 days, from April 1 to Sept. 30 each year. 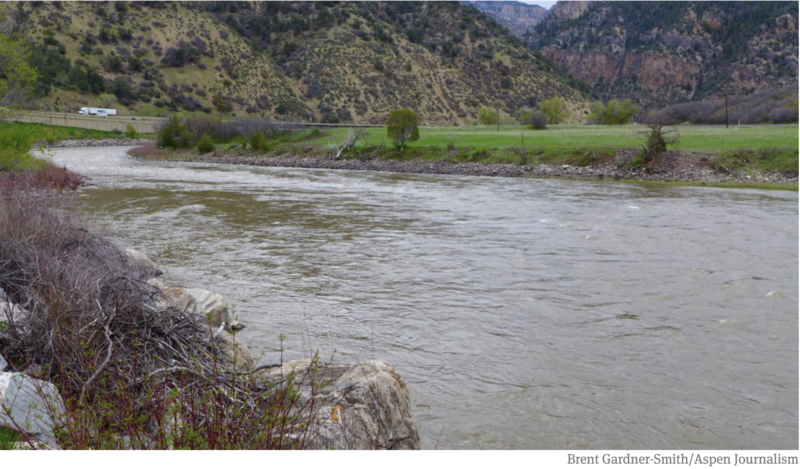 For 137 of those days, the water right calls for a steady flow 1,250 cubic feet per second, which is the same level of flow that the senior Shoshone hydropower right can call for on the river, above the proposed whitewater parks. So, for the bulk of the time, the Glenwood’s new water right would make no difference on the river, as it is in the shadow of Shoshone. But the city wants to step out of that shadow and call for 2,500 cfs of water for 46 days, from June 8 to July 23. And it could call for 4,000 cfs of flow on five days around the Fourth of July, in order to hold competitive boating events. It is in the 46-day high-flow period when the carve-out will kick in, and reduce by about 25 percent the amount of water the city was pursuing. Harris said the remaining flow levels in the river still work for the whitewater parks. Editor’s note: Aspen Journalism covers rivers and water in collaboration with The Aspen Times, the Glenwood Springs Post Independent, and other Swift newspapers. Both the Times and the Post published this story on Monday, Nov. 19, 2018.